New allies who want to support LGBT Americans often face an array of confusing terminology and language. Adapted from An Ally's Guide to Terminology, MAP's Terminology at a Glance offers a snapshot of essential vocabulary, terms to avoid, and an overview of approaches for talking about issues like non-discrimination laws, marriage and adoption—all in a short, two-page guide. Movement Advancement Project. September 2012. 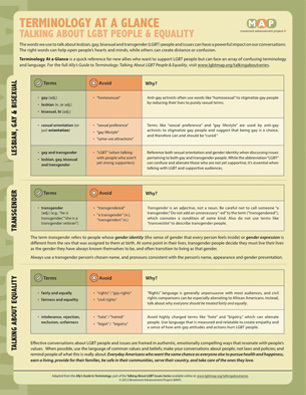 "Terminology At A Glance: Talking About LGBT People & Equality." MAP's Talking About LGBT Issues Series. http://www.lgbtmap.org/terminology-at-a-glance (date of access).